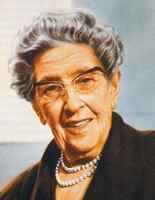 Agatha Christie was born in Torquay, in the county of Devon. Her father died when she was a child, and Christie was educated home, where her mother encouraged her to write from very early age. At sixteen she was sent to school in Paris where she studied singing and piano. Christie was an accomplished pianist but her stage fright and shyness prevented her from pursuing a career in music. When Christie's mother took her to Cairo for a winter, she wrote a novel there. Encouraged by Eden Philpotts, neighbor and friend in Torquay, she devoted herself to writing and had short stories published. In 1914 Christie married Archibald Christie, an officer in the Flying Royal Corps; their daughter, Rosalind, was born in 1919. During World War I she worked in a Red Cross Hospital in Torquay as a hospital dispenser, which gave her knowledge of poisons. It was to be useful when she started writing mysteries. Christie's first detective novel, The Mysterious Affair at Styles, introduced Hercule Poirot, the Belgian detective, who appeared in more than 40 books, the last of which was Curtain (1975). Poirot was an amiably comic character with egg-shaped head. Her other detective was Miss Marple, an elderly spinster who relied on her feminine sensitivity and empathy to solve crimes. She was born and lived in the village of St. Mary Mead. Marple was featured in 17 novels, the first being Murder At The Vicarage (1930) and the last Sleeping Murder (1977). She was reportedly based on the author's own grandmother. In 56 years Christie wrote 66 detective novels, among the best of which are The Murder of Roger Acroyd, Murder On The Orient Express (1934), Death On The Nile (1937) and Ten Little Indians (1939). In addition to these works, Christie wrote her autobiography (1977), and several plays, including The Mousetrap, which run more than 30 years continuously in London, and had 8,862 performances at the Ambassadors Theatre. Christie's marriage broke up in 1926. Archie Christie, who worked in the City, announced that he had fallen in love with a younger woman, Nancy Neele. Her divorce was finalized in 1928, and two years later she married the archaeologist Max Mallowan. She had met him on her travels in Middle East in 1927, and accompanied him on his excavations of sites in Syria and Iraq. Later Christie used these exotic settings in her novels Murder In Mesopotamia (1936) and Death on the Nile (1937). Her own archeological adventures were recounted in Come Tell Me How You Live (1946). Mallowan was Catholic and fourteen years her junior; he became one of the most prominent archaeologist of his generation. Of her marriage the writer told reporters: "An archaeologist is the best husband any woman can have. The older she gets, the more interested he is in her." Mallowan worked in Iraq in the 1950s but returned to England, when Christie's health grew weaker. Christie's most prolific period began in the late 1920s. During the 1930s she published four non-series mystery novels, fourteen Poirot novels, two Marple novels, two Superintendent Battle books, a book of stories featuring Harley Quin and another featuring Mr. Parken Pyne, and two original plays. In 1936 she published the first of six psychological romance novels under the pseudonym Mary Westmacott. During WW II Christie worked in the dispensary of University College Hospital in London. After the war she continued to write prolifically, also gaining success on the stage and in the cinema. Witness for the Prosecution, for example, was chosen the best foreign play of the 1954-55 season by the New York Drama Critics Circle. The play had opened in London in October 1953 and by December 1954, it was on Broadway. Among the many film adaptations were Murder on the Orient Express (1974), directed by Sidney Lument and with Albert Finney as Poirot, and Death on the Nile (1978), with Peter Ustinov as Poirot. In 1967 Christie became president of the British Detection Club, and in 1971 she was made a Dame of the British Empire. Christie died on January 12, 1976 in Wallingford, Oxforshire. With over one hundred novels and 103 translations into foreign languages, Christie was by the time of her death the best-selling English novelist of all time. A Hercule Poirot mystery, investigating Emily Inglethorpe's death by heart attack, John Cavendish's aunt.